Important note: The details below and on related pages refer to the Vantage Pro 2 models first released in January 2005. The key difference of VP2 models from the earlier VP1 versions is enhanced wireless performance. Anyone seeking VP1 wireless data should remember that wireless VP2 signal strength is 2-3 times stronger than for the older VP1 systems and therefore that VP1 range and wall-penetration will be correspondingly lower. This description of wireless aspects of the Vantage Pro stations is in three parts. This page contains an overview of VP wireless operation. The Wireless range in practice page discusses points that determine effective wireless range in practice. And the Understanding and checking VP2 wireless transmission page contains some more specific technical information (insofar as is currently published) relating to the wireless units together with instructions on how to monitor the quality of wireless reception. Ease and flexibility of set up: You simply mount the sensor package at the required outside location, run through a simple configuration screen on the console and, hey presto, your console should be reporting the current weather conditions. The nuisance of installing a cable to link sensors and console is no more! The availability of a wide range of wireless sensors: The wireless VP stations are able to receive data from a range of specialist sensors, including multiple temperature and humidity sensors, soil moisture/temperature and leaf wetness/temperature stations, as described in more detail elsewhere. These additional sensors cannot be added to cabled VP stations, so if you need extra sensors now or want the option of adding them in the future then the wireless VP version is essential. Less risk of damage from lightning strikes: The wireless units don’t allow the electrical surges associated with a nearby lightning strike to enter the console via the sensor cables – there is no longer any physical connection between ISS and console. Obviously this cannot change the likelihood of the sensors themselves being struck and/or damaged and a direct or very close strike will enter the building’s electrical or telephone or TV wiring circuits by other means . Fortunately, the risk of lightning damage in most parts of the UK is typically small, but the wireless units will provide a significant reduction in the probability of console and PC damage following nearby strikes. Less risk of ground loops. A ground loop is an uncommon electrical condition that can affect stations connected directly to a PC and that can cause aberrant readings, especially of wind speed and direction, on the console. This is rarely seen with wireless VP2 stations, but can occasionally be a factor with cabled stations, especially when linked to a portable PC. (NB If it does occur, this problem can be more easily cured at present with an RS232 logger version than USB and for this reason we recommend RS232 interface loggers for use with cabled VP2 stations). Wireless range is limited. This is perhaps the most important constraint to consider with wireless models. The VP stations use a relatively low‑powered transmitter in order not to require an official licence (and also for extended battery life at the ISS). Range is therefore limited (though 2-3 times longer than for the previous VP1 stations). Just how limited depends on many factors. The maximum range will obviously be seen outdoors in direct line-of-sight with no intervening buildings or vegetation. The small transmitter and receiver aerials need to be in alignment for maximum range to be achieved and in practice this often means that the two should be at roughly the same elevation, preferably positioned at least a few feet above ground level to avoid part of the signal being lost in the ground itself. Under these conditions a range of up to around 250m, possibly more, may be attainable, though 100-150m is a more realistic maximum. (It’s generally sensible not to aim to operate the station routinely at maximum range since there is then no reserve of signal strength to compensate for temporarily adverse reception conditions). At the other extreme, any metallic sheet placed between sensors and console could completely block the signal, even at short range, which could happen for instance where metal has been used in the cladding or roofing of a building, or where a console is placed behind a metal fridge/filing cabinet etc. Standard internal stud walls should give only moderate signal attenuation. Brick and concrete block walls may have a more pronounced effect. Every installation will have its own unique set of characteristics, which makes it very difficult to predict exact range. If you have a cordless DECT house phone, then the range of good phone reception around your house or other premises will give a very rough guide as to the likely range of the VP signal. Essentially one might expect that the sensors could be mounted 50-70m from the house or building with the signal path passing through perhaps one external and one internal wall, but please note that this is NOT guaranteed. For more details on likely wireless range, please see the wireless range in practice page. 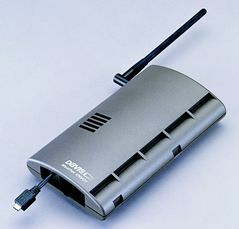 For longer wireless range, Davis supplies a wireless repeater option. This is placed between wireless sensors and console and essentially acts as a staging post for the signal. A repeater can be very effective and can extend wireless range significantly, though it is obviously an added expense. For very long distances, multiple wireless repeaters in a chain can be used. Vulnerability to interference. Wireless models can be more prone to interference than the corresponding cabled models. Once again, how pronounced this effect is will depend on local circumstances. Placing the console at the limit for reliable reception may be OK in a rural location where there are few other sources of interference. But in an urban setting, interference from mobile phones and other wireless transmitters could weaken the signal to an unacceptable extent. Therefore the maximum distance for reliable reception will vary with location. The importance of interference also varies according to the use to which your weather data may be put. Thus, if you primarily monitor current weather conditions as a hobby or interest, then a momentary glitch in a parameter value (ie as might be caused by transient interference) might be of no consequence. But if you maintain a permanent log of weather data perhaps for business or legal reasons, then an aberrant minimum or maximum value caused by interference at some point in the day is going to matter. If this is the case, using a wireless repeater could be the answer to creating permanently reliable reception. Alternatively, a cabled station might be the better solution for such installations. It is worth noting that the increased signal strength and the introduction of frequency-hopping wireless technology do make the VP2 models still less vulnerable to interference effects, but for planned use in an electrically-noisy environment, the possibility of interference should be considered. Occasional reception loss may be seen: While most VP2 wireless systems provide excellent reception, it is the case that because of interference, seriously adverse weather conditions, operational reasons or whatever other cause, wireless systems do not always deliver the total 100% continuous weather record usually offered by cabled systems. On close inspection, some users will notice an occasional break in reception. In general, because of its typically transient nature, this is of little consequence to comprehensive record-keeping. But users seeking the absolute maximum continuity of successive weather records might wish to consider the cabled station versions. Some constraints on sensor siting remain when the standard wireless ISS is used. In the standard VP wireless system, there is only one wireless link from sensors to console, which is via the transmitter in the ISS. Therefore all standard sensors (plus solar and UV sensors) need to be connected back to the ISS by cable, if they are detached from the main ISS assembly. Typically, it is the anemometer that needs to be detached from the ISS (because the suggested height of mounting for the ISS is 1.2m (4 feet) in order to measure air temperature accurately, whereas the anemometer should be mounted as high as is practicable). The anemometer is supplied with a 12m cable length to allow for this differential mounting. Note that a separate wireless transmitter is available as an optional extra for the anemometer, but naturally adds to the cost of a new system. In summary, the VP2 wireless models clearly score highly on convenience and will offer good reception in most circumstances, but if your requirement calls for long wireless range AND penetration to well inside a building or you’re concerned about the possible effects of serious interference, then the cabled models may be a better or more cost-effective (ie not requiring the use of repeaters) choice for a standard VP2 station.